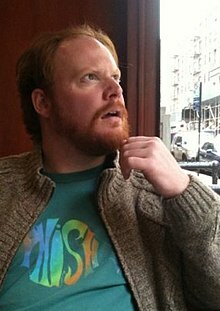 Matt McCarthy (born November 9, 1979 in Providence, Rhode Island) is an American comedian, writer, improviser and actor living in Los Angeles. He is best known for appearances on Conan, The Pete Holmes Show and CollegeHumor.com and as host of the We Watch Wrestling Podcast. McCarthy currently appears as Richard on the Comedy Central show Corporate. Matthew McCarthy, the youngest of three, was born in Providence, Rhode Island at the old Women & Infants Hospital on Maude Street. He grew up in an Irish-Catholic home in Rumford, Rhode Island and attended St. Margaret's School and La Salle Academy. Described by The New York Times as a "John Belushi-like madman", McCarthy began performing standup comedy after graduating from Fordham University where he was the mascot, The Ram, from 1999 to 2001. Studied improvisation at the Upright Citizens Brigade Theater in Chelsea. McCarthy is known for having red hair and, often, a beard. He portrayed The Cable Guy in a series of Verizon FiOs commercials. Appeared as a contestant on an episode of the television show Cash Cab, which aired on June 26, 2006. McCarthy hosted Action Pack on AMC with Nick Stevens. Coined the phrase, "You have got some brass, son!" in a St. Patrick's Day commercial for Guinness. Starred in multiple CollegeHumor shorts, including the Jeggings series, the Badman series and as Nicolas Cage's Agent, among others. McCarthy co-founded the sketch video group Front Page Films. FPF made videos for Doritos, Crunch Fitness, CollegeHumor, and Comedy Central. FPF's HOTEL, DOCTOR and KID FARM series were featured on Atom.com and Comedy Central's Tosh.0. From November 2011 to October 2012, worked as a creative writer with WWE. Was a guest on The Nick & Artie Show in October 2012. Summer 2013, McCarthy, an avid pro wrestling fan, began recording episodes of the We Watch Wrestling Podcast with fellow stand-up comedians Vince Averill and Tom Sibley and producer Rob Sibley featured on iTunes New & Noteworthy page. October 2013 through June 2014, McCarthy was a series regular and writer on The Pete Holmes Show on TBS following Conan. Began performing comedy in New York City in 2003 at various open mics, barker shows, and bringer shows. Quickly found a home in the East Village at the now defunct Comedy Social, a weekly comedy showcase at Sin Sin bar. Soon after, hosted stand-up at Mo Pitkin's House of Satisfaction. McCarthy had a month-long run of his solo show "McCarthyism" at the infamous Rififi Cinema Classics. McCarthy also ran "The Matt McCarthy Stand-Up Comedy Show" at Comix NY for several months. In 2011, McCarthy ran a monthly comedy extravaganza called MARKING OUT in Manhattan. His standup comedy television performances include Season 3 of Live at Gotham, John Oliver's New York Stand Up Show' on Comedy Central. McCarthy has performed at such festivals as Just for Laughs in Montreal, All Tomorrow's Parties, Sasquatch! Music Festival, Outside Lands Music and Arts Festival and Bonnaroo. Named one of LA Weekly's Comics to Watch in 2014. 2019 Black Monday (TV series) Flanny Episode "Money Pot"
Episode "Adam Ruins Money" "Adam Ruins The Economy"
2015 Brooklyn Nine-Nine Arman Episode "Payback"
2013 Adam Devine's House Party Bowling Team Buddy Episode "Neighbor Party"
2012 Louie Actor Louie Episode "Dad"
2012 White Collar Mr. Cooper Episode "Upper West Side Story"
2011 Bored to Death Tiger Episode "We Could Sing A Duet"
2011 Curb Your Enthusiasm Baseball Heckler Episode "Mister Softee"
2011 Whitest Kids U' Know Union Soldier Episode "Civil War on Drugs: part 8 & 9"
2010 John Oliver's New York Stand-Up Show Himself Episode "Hannibal Buress, Pete Holmes, Matt McCarthy, & Janeane Garofalo"
2008 Live at Gotham Himself Episode "Host: Kevin Hart"
^ "R.I. native is finalist in Doritos Super Bowl ad contest". PROJO. January 24, 2009. Retrieved January 18, 2010. ^ Belson, Ken (January 22, 2009). "Beer Flavored Doritos on the F Train". NY Times. Retrieved January 18, 2010. ^ "Fordham Ram feels up Rudy Giuliani on morning news". YouTube. February 15, 2009. Retrieved January 18, 2010. ^ "FiOS TV: Picture Quality Ad". YouTube. September 28, 2009. Retrieved January 18, 2010. ^ "AMC Action Pack". AMCTV. January 18, 2010. Retrieved January 18, 2010. ^ "You have got some brass, son". YouTube. March 12, 2008. Retrieved January 18, 2010. ^ "Doritos Super Bowl XLIII Commercial: New Flavor Pitch". YouTube. January 27, 2009. Retrieved July 15, 2009. ^ "The Private Gym". YouTube. October 19, 2009. Retrieved January 18, 2010. ^ "CH Originals: Batman Vanishing". YouTube. November 22, 2009. Retrieved January 18, 2010. ^ "HOTEL". ATOM. July 7, 2009. Retrieved January 18, 2010. ^ "Former WWE creative team member goes in depth about his recent run with the company". PROWRESTLING.NET. February 12, 2013. Retrieved February 12, 2013. ^ "Matt McCarthy's Marking Out at Ace Hotel". acehotel. January 24, 2011. Retrieved July 26, 2011. ^ "John Oliver's New York Stand-Up Show debuts Jan. 8 (Video)". Monsters and Critics. January 7, 2010. Retrieved January 18, 2010. ^ "Outside Lands 2014 Line-Up". SFOutSideLands.com. August 10, 2014. Retrieved August 20, 2014. ^ "Bonnaroo 2015 Artist Page". bonnaroo.com. June 11, 2015. Retrieved June 19, 2015. ^ "LA Weekly 2014 Comics to Watch". LAWeekly.com. January 2, 2014. Retrieved January 2, 2014. This page was last edited on 4 February 2019, at 06:25 (UTC).